Door N Key - Residential locksmith in Palm Beach Gardens, FL. Have you purchased a new house? Have you been doing renovations and want to install a new lock on the front and/or back door? This is the perfect time to contact a residential locksmith in Palm Beach Gardens to get the job done properly. We specialize in a variety of services including home security locks, high security locks, home lockout service, and we can even rekey door lock systems with ease. We are well-versed and experienced in a wide range of models and types of door locks. Door N Key can handle your job with ease and of course professionalism. Choosing to install high security locks on your house is almost a given nowadays. It’s an excellent way to keep your house safe and secure when you’re home and away. High security locks are able to give you that peace of mind that traditional ones just can’t offer. At the same time it can be rather tricky to change locks that are high security systems. In fact, it’s best that you leave it to the experts. We are trained in a variety of high security lock systems which means we can come in and change the locks with ease. After a busy day at work, or a long day out with the family, the last thing you want to deal with is coming home to find that you have locked yourself out of the house. Maybe you left your keys on the table at the front door as you rushed to leave, or perhaps you lost them while you were out. 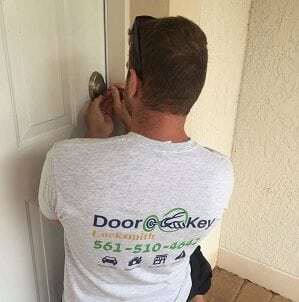 No matter how it happened, you can count on Door N Key to provide quick and efficient home lockout service in Palm Beach Gardens. Our number one priority is to get you into your home quickly so that you don’t find yourself sitting on your front porch fuming and worrying about how you’re going to get into the house. Do you have a home security locking system? Perhaps you have a digital pad that requires you to key in a specific code. Even these high security locks can act up from time to time, or you may suddenly forget the code. Rather than try to force your way in by breaking a window, or breaking the lock, give us a call to take care of the problem. We are available 24/7 to assist you and get you back into your home in no time. We know our way around these home security locking systems, and have no problem getting you into your house. In order to keep your house secure it’s always a good idea to rekey your door lock from time to time. Maybe you’ve just purchased a home, in which case it’s even more important to rekey the door lock. This is exactly why we offer our rekey door lock service, which is very popular with our customers. This is a highly advanced service that is not a DIY project. It needs to be done correctly or you risk damaging the lock. Simply give Door N Key a call and our locksmith will come out to your residence and rekey the door lock.